All Lathrop homes currently listed for sale in Lathrop as of 04/18/2019 are shown below. You can change the search criteria at any time by pressing the 'Change Search' button below. If you have any questions or you would like more information about any Lathrop homes for sale or other Lathrop real estate, please contact us and one of our knowledgeable Lathrop REALTORS® would be pleased to assist you. "This stunning, single level Mediterranean style home in Mossdale Landing is a dream! Its modest curbside view conceals nearly 2600sf of luxurious finishes in an environment that's both elegant and family friendly. Step through the custom doorway in the sequestered courtyard, and high-end features compete for your attention. Brazilian Cherry floors lead to mosaic tile accents, travertine marble passages with vaulted ceilings into the living room, formal dining room, and the generous kitchen, where cherry cabinets warm the room. The cabinet depth stainless fridge complements the commercial grade gas cooktop, double ovens, and wine fridge. Gleaming black granite countertops and expansive island/breakfast bar offer a cozy gathering point for quick meals, while the gas fireplace warms the open-concept family room nearby. The spacious master bedroom opens into a luxurious en-suite bathroom with jetted soaking tub, separate walk-in shower, double sinks and walk-in California Closets. The additional two bedrooms don't skimp on size or closet space, and the office with its double doors allows the telecommuter plenty of privacy to work from home. It's wired to be a smart home with alarm system, optional CCTV, coded key entry, etc. Step into the generous backyard with its covered patio, custom above-ground pool, spa, outdoor fireplace and deck, cooking areas with concrete island and matching, built-in BBQ. The laundry room leads to the tandem 3-car garage with more storage." "Enjoy this Charming, Cozy 3 Bdrm 2 Bath Home in Lathrop with direct access to ACE Train and I-5. You'll quickly notice the Pride of Ownership in even the smallest details. Brushed Nickel Handle Hardware, Ceiling Fans in every room, and a Beautiful Wood & Glass Front Door. Enjoy Stainless Steel Appliances, Granite Counters, and Re-Finished Kitchen Cabinets with Pullouts. 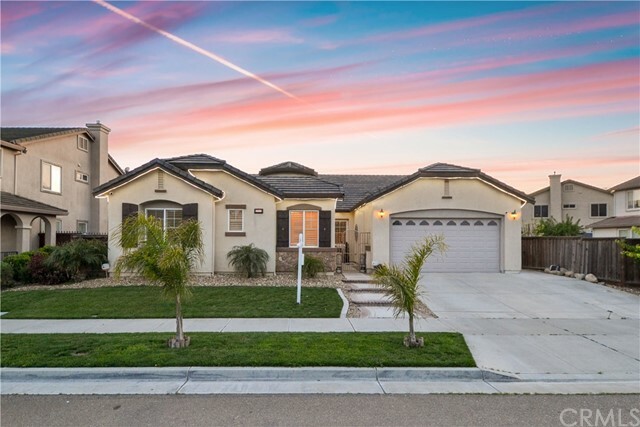 You'll appreciate a New Garage Door, New Master Bath Tile Floors and Shower Doors, a Water Softener, Three Skylights, 14 Camera Security System, and Reverse Osmosis. Best of all...SOLAR ENERGY! Seller to pay off at closing. This Gem is offered at $394,900. Hurry...this beauty won't last!"